This distillery opened up not too long ago relatively close to my neck of the woods (that being the Chicago area generally—it's still over an hour away). However, when I happened to have an early afternoon meeting for work in Evanston only a couple blocks away, I had to visit the distillery. At first I thought I might have had the address wrong. All I saw were store fronts, with no indication of a distillery nearby. However, after getting out of my car and wandering around in the rain for a bit, I finally found the place tucked back at the end of an alley. From the outside, it looked like nothing more than an old garage that is now only used for storage. However, I stepped inside to a nice welcoming area of the distillery and the heavy scent of corn mash (a smell I grew familiar with when I was young and growing up near Pekin, Illinois). 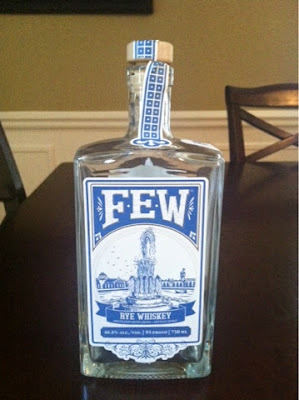 I perused the selection of spirits offered by FEW distillery, including a white whiskey, a standard whiskey and multiple gins. I was there for the whiskey, though, and, quite frankly, I already knew that the bottle I'd be bringing home was the rye. That being said, I couldn't leave without first tasting a couple nips of the whiskey and the bourbon, both fine offerings, though both tasting their age (approximately 2 years). The owner was nice enough to dismantle a gift set in order to sell me the last bottle of the rye they had in stock, and I went on my merry way. I hope to get back sometime soon for a tour when I might have more time. On to the whiskey. FEW Rye offers everything you'd expect from a well-established rye. Despite being only 2 years old, it still offers that strong contract of spicy and sweet. The corn is very noticeable, but the rye is by no means overpowered, providing a strong taste of rye bread. Additionally, notes of vanilla and honey hit the tongue, followed shortly by plum and berry flavors, with a hint of orange at the end. The flavors all converge for one tasty whiskey that I found myself going right back to over and over. This rye absolutely does not betray its age, providing as robust and complex a flavor as its older counterparts—an excellent rye!